Authentic & Friendly Eco Jungle Lodge, with Meal Inclusive Plan. 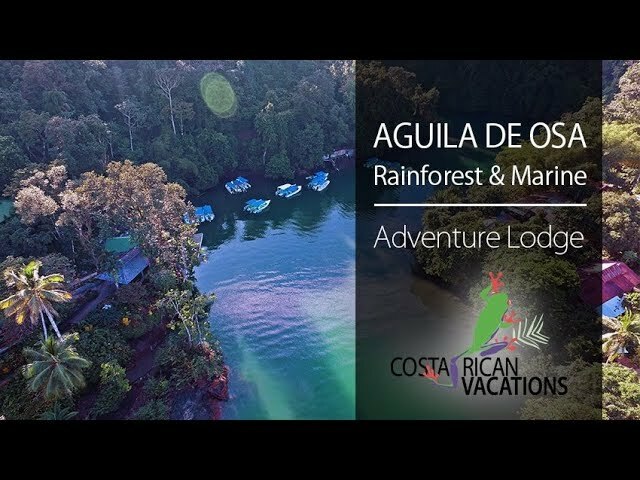 On the outskirts of Corcovado National Park in Costa Rica’s Osa Peninsula, the Aguila de Osa Inn is a captivating little eco-lodge perfect for families and couples looking for a relaxing jungle retreat with limitless access to the surrounding rainforest, ocean, and wildlife. Aguila de Osa’s property spans an impressive 28 acres of protected rainforest. The hotel’s 11 Guestrooms and 2 Suites are terraced up the lush cliff side overlooking the picturesque bay. The guestrooms maintain the lodge’s rustic style with natural wood furnishings and basic amenities like ceiling fans, minibar, and warm showers. Rocking chairs and hammocks line the patios with the most stunning ocean and jungle views. If connectivity is essential during your stay, complimentary WiFi is available in rooms and the main rancho and restaurant area. In order to provide the most natural experience possible, there are no televisions or air conditioning in the rooms. Dining at the Rio Selva Restaurant is a fascinating experience where guests will enjoy a full meal plan of breakfast, lunch, and dinner. Cocktail hour before dinner is a highlight for many, with music, appetizers, and beverages, all the hotel guests gathering to share the day’s exciting encounters. Dietary restrictions and food allergies can be accommodated with notice. The homemade bread is a personal favorite! Guests can enjoy complimentary use of the hiking trail and kayaks to explore the river and surrounding bay area. Activities like snorkeling at Caño Island, zip lining, sportfishing, and more can be arranged with hotel staff (at an additional cost). And don’t forget the beach – Drake Bay is just 400 meters away on a small trail, or you can take a peaceful 20-minute walk through the jungle to get to other beaches. Rates include daily meals (beverages are extra) and round-trip water/land transportation to Palmar Sur or Drake Bay airstrip. Marine life including hawksbill sea turtles, white-tipped sharks, several species of moray eels, sting rays, and much more live only 12 nautical miles from the inn at Caño Island, a paradise for snorkelers, scuba divers, swimmers, and sunbathers alike. The Inn promotes socializing among guests with family-style dinners included in the price and intimate group tours to abundant nearby natural attractions. Wildlife—thanks to its remote location, guests are almost certain to view tropical wildlife from giant iguanas to colorful birds, alligators, coatis, and howler monkeys, all from the comfort of their cabin or the open-air restaurant. Costa Rican coffee served in insulated carafes before dawn where spectacular Pacific views await you. Despite its remoteness, the Inn provides 24-hour electricity, hot water, and charcoal/UV-filtered drinking water.